IRMO, SC (WIS) - A teacher at a Midlands elementary school has been placed on administrative leave after giving a homework assignment to students that involved a question about the Ku Klux Klan, according to a Lexington-Richland School District 5 spokesperson. 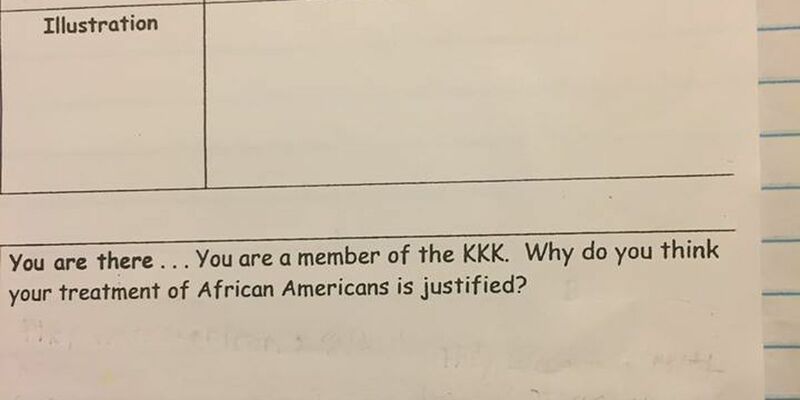 Screenshots of the homework assignment, given to students at Oak Pointe Elementary School in Irmo, SC, were posted on Facebook by Tremain Cooper, who said his nephew was given this assignment by his fifth-grade teacher. The assignment includes a grid that has KKK on top and lists the group's "purpose and motivation," "effects on opportunities of African-Americans," and "Illustrations." In addition, the questions read, "You are there...You are a member of the KKK. Why do you think your treatment of African Americans is justified?" Another question reads: "You are there...You are a freedman. Are you satisfied with your new life? Why or why not?" Cooper wrote in the Facebook post on Thursday that his nephew was upset and he was in disbelief of the questions. "How can she [the teacher] ask a 5th grader to justify the actions of the KKK," Cooper wrote. The teacher will remain on administrative leave until the investigation is complete. The teacher was not identified by the school district but was identified in social media posts made by Cooper. We reached out to the family of the student, who did not wish to make a statement at this time or be interviewed.